This dish is low in calories and fat, so is a fabulously tasty way to stay healthy. Whizz the onion, chilli, fresh and ground coriander, apricots, fish sauce and lime juice in a food processor to make a marinade. Put the chicken in a bowl and stir in three-quarters of the marinade. Cover and chill for at least 1 hour. Preheat the grill to medium-high. Thread the chicken onto 8 skewers and put on a non-stick baking sheet. Grill for 10 minutes, turning halfway. Meanwhile, stir the remaining marinade into the yogurt with the garlic. 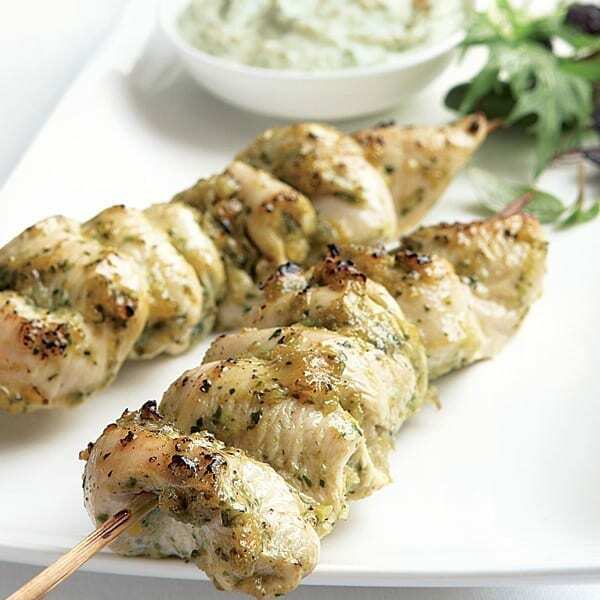 Serve 2 skewers each with the garlic yogurt and a green salad. This marinade is also perfect for pork and lamb fillets.